Nirvana is part of the Woodridge community which is 1 mile fron the junction of the 192 and 27. The home itself is about 1 mile from the 27, so no traffic noise disturbs the peace and quiet of the countryside over which the house looks. Back on the 27, all within 1 mile there is a Winn Dixie, Walmart, bank, post office and various restaurants offering eat-in and take-away service. Our home is on one of the largest plots on the development, with the rear of the house facing west and south so that the pool area gets all the afternoon sun. Because it is next to an easement the nearest house to our pool area is over 40ft away. 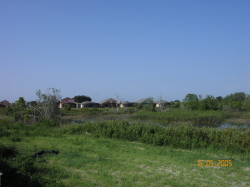 The view behind the house is on to the natural Florida scrubland and a large pond with an island in it. Without effort we saw many interesting birds including sandhill cranes, black vultures, hawks, egret,s herons, ibis and many smaller species. the pool is 33.5 ft long - the largest that we know of, and the deck has a 16 ft x 12 ft roofed area, for those wanting the shade. the house is fully furnished with everything you could need, from cable TV and DVd to microwave, from washer/dryer to linen and towels. The house has air conditioning, in nearly 2,500 sq ft of floor space. All rooms are generous and the 5 bedrooms have sleeping for 13 without the need for sofa beds. The family room has TV, DVD and audio centre and there are TVs in all the other rooms. All the bedrooms have hairdryers and clock/radios. The two master bedrooms have king beds, two of the other bedrooms have queen and a twin bed in them, one bedroom has a queen and one master has a twin bed. There is a games room with table tennis, air hockey, electronic darts and board games. The house has 8 beeds making it IDEAL for those WINTER GOLFERS who wish to take advantage of the TWENTY PLUS golf courses that are within easy driving distance. It is 10 minutes from Disney, Universal and Sea World are about 20 minutes away. The Gulf and Atlantic coasts are about one hour away. Balance to be paid - 45 days to arrival.